If there were any lingering doubts over whether the United States is in the midst of a teachers’ strike wave, developments over the past few days should put these to rest. On Friday, the Bureau of Labor Statistics released the official strike data for 2018 and the verdict is clear: “The number of workers involved [in work stoppages] was the highest since 1986.” Of these strikers, the overwhelming majority were educators. No less significantly, unionized teachers in Denver this weekend decided to move ahead with their work stoppage, which begins on Monday. Denver’s strike underscores that the recent victorious blue-state teachers’ revolt in Los Angeles was not an anomaly. Like in LA, this is fundamentally a strike against the austerity and “education reform” agenda imposed by Democratic Party politicians for well over a decade. Under the inspiration of the nationwide teachers’ upsurge, and the initiatives of a new rank-and-file caucus, Denver’s educators have successfully pushed their union to fight for the schools that students — and teachers — deserve. 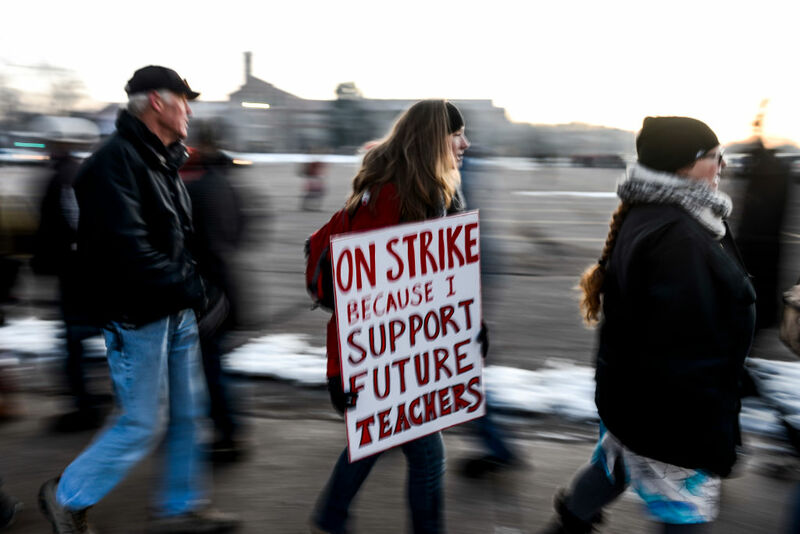 The roots of Denver’s strike can be traced back to decades of stagnating wages and pro-corporate “education reform.” But, above all, it’s been the policies imposed since the Great Recession that have pushed Denver’s teachers to the brink. Though salary questions are at the center of the current round of bargaining, Denver’s strike is fundamentally an expression of teachers’ rejection of the corporate reform agenda. After years of being scapegoated by district leaders and media pundits, education workers see the current strike as a means to assert their worth and dignity — and to push back against the “portfolio” model that has degraded the city’s public schools. Beginning in 2009, billionaire-funded organizations like Democrats for Education Reform have spent huge amounts — well over $250,000 per race — to capture the local school board. This investment has paid off well: a majority of Denver public schools are now either privately run charters or “innovation schools,” which are largely exempt from existing regulations and public oversight. In line with the “portfolio” model, Denver schools have been forced to compete with each other. Despite the lack of evidence that standardized testing accurately measures student achievement, test scores have become a key metric for whether a school is allowed to continue to exist or not. Over forty-five schools have been closed in recent years. This radical transformation of Denver schools has brought about many changes — but improving student achievement has not been one of them, even if one accepts the questionable criteria of test scores. By almost any metric, “education reform” in Denver has been a resounding failure. And the city now has one of the highest achievement gaps between white and nonwhite students in the country. Yet district leaders have continued to double down on their project of dismantling and privatizing Denver public schools. The main policy that has pushed teachers to strike is the ProComp “merit pay” program. In this excessively opaque and unstable system, teacher salaries and bonuses depend on a series of metrics such as state testing progress or working in a low-income school. Initially, ProComp was pitched as a voluntary program through which teachers could make some additional money. Teacher union officials, due either to naivety or cowardice, actively supported its implementation. ProComp has steadily become a vehicle to lower the base pay of teachers, to cut district contributions to educators’ retirement funds, and to impose the privatizers’ pedagogical vision upon Denver schools. Teachers complain of the financial instability caused by not knowing one’s salary from one year to the next. Others note that receiving bonuses frequently has little to do with their personal performance as a teacher, since so much depends on how their schools are designated by the district. The current bargaining impasse is primarily due to the district’s insistence on channeling funds to provide large retention bonuses for “high-priority” schools. Union representatives have responded by demanding that these funds, and more, go to increasing the base salaries of all educators and to providing more “lanes” for regular pay increases. Nobody in the teachers’ camp denies that public education has deep structural problems, particularly when it comes to working-class African-Americans and Latinos. Like all major institutions in the United States, public schools are not free from the impact of institutionalized racism. Yet it hardly follows from this that privatization and “merit pay” are viable solutions for improving the educational opportunities of oppressed communities. In fact, as union activists continue to point out, the city’s data shows that bonuses don’t actually improve teacher retention in schools with higher percentages of students of color. In Denver, like across the nation, privatization schemes and high-stakes testing have not only failed to close the achievement gap, but they have actually exacerbated school segregation and racial disparities. It was therefore more than rhetoric when the Denver Classroom Teachers Association (DCTA) last October declared that “the District is creating a system that furthers institutionalized racism and promotes segregation . . . It is time to put students and school communities first.” According to union vice president Christina Medina, addressing teacher turnover and winning equity requires fully funding public “community schools” capable of providing comprehensive wrap-around services to high-need students and families. Two key developments led to the union’s progressive reorientation. In 2016, a group of social justice educators inspired by the 2012 Chicago teachers’ strike and its CORE caucus, formed the Caucus of Today’s Teachers in the hopes of turning DCTA into an organization capable of fighting back for teachers as well as students and the communities they serve. In the spring of 2017, Denver’s caucus succeeded in electing its member Christina Medina as DCTA vice president and it has subsequently won almost half of the seats to the union leadership. The efforts of caucus members to transform the union have been met with an enthusiastic response from below — since the push towards a possible strike began in earnest half a year ago, DCTA’s membership has surged from roughly 52 to 68 percent of Denver educators. And with new union elections pending, the old guard is clearly wary of getting swept out of office if it doesn’t go along with the upsurge. When teachers saw these other strikes, beginning with West Virginia, they gave us so much hope and they raised our expectations. I’ve talked to a lot of teachers here who are still scared, who say they can’t afford to strike. But now the strike in Los Angeles has done so much to dispel these fears. If they could do it, why can’t we? Not very long ago, such proclamations may have sounded like wishful thinking or leftist bluster. But today, after almost a year’s worth of victorious mass strikes, and a worker-won end to the federal shutdown, working-class confidence feels more than justified. With a late February strike now set in Oakland, and a new strike looming in West Virginia, there’s no end in sight to the teachers’ revolt. And nobody should underestimate the explosive mix of a strike wave combined with the socialist electoral upsurge led by Bernie Sanders and Alexandria Ocasio-Cortez. It’ll be a long time before we have the billionaires on the ropes — but at least our side is now putting up a real fight.